Registration NOW OPEN for C of E Session 2! CALLING ALL YOUTH SOCCER PLAYERS IN THE WESTERN SUBURBAN AREA!! Sports Excellence Group, in conjunction with Lyons Township Soccer Club, are proud to present this community's first CENTER OF EXCELLENCE! This program is designed for any and all soccer players with birth years 2010-2005 who are seeking a high-intensity and professionally designed program to train the complete soccer player. 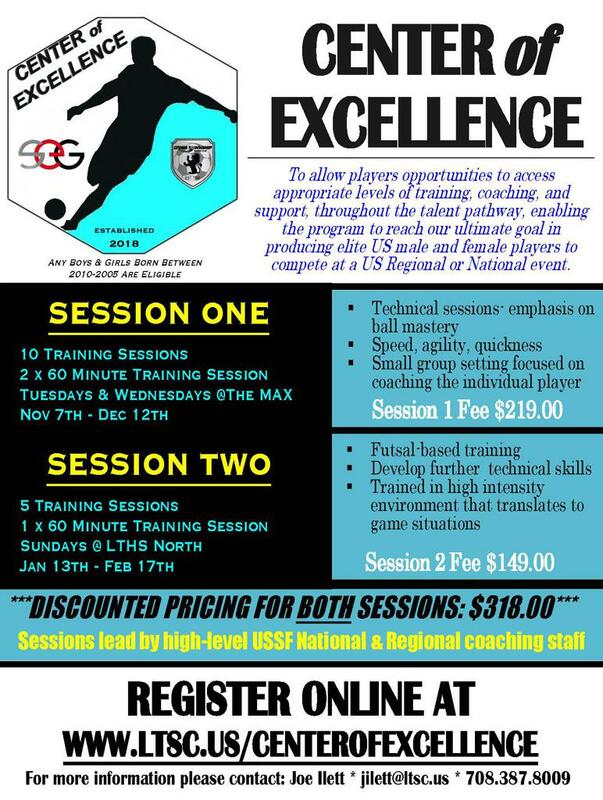 All training is lead by USSF Regional or National coaches from across the Chicagoland area. The Center of Excellence wants to establish a professional and neutral space where players of all backgrounds can come together collectively and train with expert trainers with the goal of advancing down the US Soccer talent pathway toward producing elite male and female youth soccer players. Participants in the Center of Excellence will not only be challenged and trained in a different capacity, but selected players from the Center will be selected to represent this community at a US Soccer National or Regional Competition.